Screen spline can often be reused when you repair a screen but sometimes you cant because the old stuff is in such bad shape. Or you might want to make your a new screen frame and just need to replace everything. Spline is a available in quite a variety of shapes and sizes. The average hardware store stocks only a couple. Most likely the frame you have to work on requires the size they dont have. Your local glass shop may well sell you the right size you need, just rememeber to bring a sample of the old that you removed so you can be sure to get the size right. If you still cant find the right size, try the links in the chart. What types of splining are there ? Splining comes in rolls that look like electrical wire, except it is solid all the way through. Often you will see "Polyfoam" which is like foam rubber except with very small air bubbles. It is available in sizes measured in decimals of an inch. For Example #140 is .140 of an inch. The most common sizes or diameters in Southwestern Ontario, Canada, where I live are .160, .180, .200 and .250 inches diameter. I believe the above sizes are pretty common across North America too. The sizes used depend on who the predominant supplier of windows was when most of the houses were built in your area. The .250 size replaces the 1/4" aluminum spline that was used in houses built in the fifties and sixties. This size is particularly easy for the do it yourselfer to roll in. Screen spline is made in many different materials . There is EPDM which is a kind of hard rubber, there is also hollow core vinyl. Hollow core vinyl can be stretched as you roll it in, which helps if the diameter is just a little too big for the frame you are working on. Polyfoam is best for the beginner though because it can be used in wider variety of frame styles and is easier to roll in. 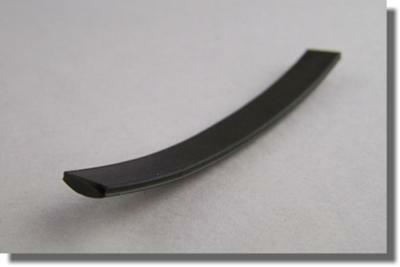 There is also "T-spline" that is used a lot in the very thin frames used in aluminum storm doors. This is usually made of extruded vinyl and its cross section has the shape of a letter "T". It also is available in the same size descriptions as polyfoam. When you roll this in you have to get the flat top of the letter T to lay down in the spline channel. That way it locks the material in place much more surely than regular polyfoam splining. With the T stuff however, you have to have exactly the right size, otherwise it just will not work. Some window manufacturers have used weird and wonderful shapes in their custom screened doors in the past. Some of them have used glazing vinyl to hold the cloth in. Your local glass shop can probably help you sort out these situations and get you the right material. I get a lot of questions from visitors about splining so I have posted some of them below in the hopes that your own questions might be answered. I am constructing several cedar screen doors and would like to know the spline grove dimensions for .180" splining. If the splining is .180" and I use aluminum screening what would be the correct grove width and depth? For polyfoam, (The kind thats most often available at local hardware stores )the groove is usually the same diameter as the splining. Aluminum screens either use a tapered groove, or a ridge at the top that kicks in about .005 of an inch, as a means to stop the splining from rolling out. I would suggest cutting a test groove and consider using ribbed splining 0.180" diameter. The ribs may offer more grip or bite in a rectangular groove in wood. Many companies used hollow square aluminum tubing and even solid 1/4" steel rod for spline back in the 1950's and 1960's. You can replace the aluminum and steel spline with 1/4" diameter plastic, either polyfoam or vinyl. To remove the old, you will need to use a sharp awl and dig into a corner of the screen frame to hook the aluminum out of the channel. Just make sure you have the plastic screen to replace it first ! Be glad to help if you cant find the right size splining locally. I was looking for square vinyl, so far no luck. I have a piece of it that a contractor brought over, it basically replaces really old .180 spline where the .180 standard splining just rolls out of the channel. Every heard of it or know where to get it? I am going to build some replacement screen windows for a cabin. Instead of the traditional wood/wood molding the screen frame has a mortise in the center and what appears to be a very narrow rope material which holds the screen in place. I need to copy this technique as the restoration needs to be like others in the community. Some old vacation cabins. My question is where do I buy the roping material which fits into the mortise and secures the screen. The mortise looks to be about 1/8 to 3/16 wide and maybe 3/8 to 1/2 deep. It sounds like the builders of your cottage borrowed a technique from the canoe and chair building industry. They used a channel and forced in a rope or wooden splining to hold the screen in place. Usually I replace this with black polyfoam splining which is comes in diameters of 0.160" all the way up to 0.250". The 0.250 inch diameter was a very common size from the 1940's through the 1960's. I can sell you a roll of 0.250 polyfoam spline. If you want to try your hand at the original rope technique you will probably need to experiment with a few different sizes of rope. Boat builders, especially those who build traditional wooden canoes would probably know of suppliers for this material. How does one select the correct splining? I replaced screening on a pool enclosure door. The old spline was flat. I found it extremely difficult to insert new flat splining in one area of the door and wondered if a round spline should have been used. Can the type of splining required be determined by examining the splining slot? If so and round is required, how does one determine size and smooth or ribbed splining. If the original door used flat splining then you need to use the same spline to replace it. Some enclosures from the 1950's and 60's use flat "glazing vinyl" instead of the round splining we use today. Where do I get T splining and are there any tricks or anything I should know about installing it? I sell T splining, I just need to know the size you need. The picture shows how T splining is installed with the T shape upside down where it locks the splining into the channel. What length does the T shape come in ? and how do i know what the Size is that i need ? I have T Splining in a few sizes that I can sell by the foot. You can also buy it in 100 to 200 foot rolls as well as rolls with 1000 feet for contractors. The most common sizes that I find are .180 inch for sliding screen doors and .250 inch for storm door screens. It is made in .010 inch steps as follows: .160, .170, .180, .190 and so on up to .250 inches. The size is measured across the width of the "T"
Rolling "Pet Screen" into patio extrusions with 5/16 flat splining. Pet Screen installation is "ABSOLUTELY BRUTAL". I'm building a rather large porch using walls of patio aluminum extrusion, 5/16 flat spline, and a product named "Pet-D-fence" 15 X 11, .025 material. The material does roll very tight into the spline groove but the strength required to roll the spline in is incredible. I do roll the screen into the groove before actually rolling in the spline. Lubricating with saliva seems to help. I'll likely become de-hydrated before rolling-in the planned 380 feet of spline, however. I will not sacrifice strength of the application just to make it easy. However, is there some lube to use that will leave the rolled joint dry strong & tight for the long term, and not degrade the spline material, screen material, or aluminum powder coat? With any screen material, the force required to roll the spline in is not supposed to be excessive. You need to use a smaller spline than your screen frames originally used because pet screen is much thicker. The size of spline you pick has to be a balance between ease of rolling in and holding power. With pet screen, the material will be able to pull out of the frame with enough force. But that is generally an advantage because it can be rolled back in where normal screen would tear and have to be replaced. The only way to get ultimate holding power is to have the splining forced in place in the factory with mechanical presses and special tooling. But thats only prictical if you are making hundreds screens of the same size. One compromise might be to be use smaller pet screen panels in the lower half of the screen porch and use regular screen material in the upper panels where pets cant reach. I have an aluminum screendoor that has only screen on it no glass i think its a larson it has a nearly flat screenbead that is one quarter inch wide . it is not reusable and i cant find anything like it at the local hardware store can you help? If you can upload a picture of the splining I can check my catalogs. Cant find it anywhere and need it fixed with in four days. Flat plastic splining - took ours out of the front door and cant find any anywhere! Have a metal screen/storm door that we took ripped screen out of, and now no one has the kind of splining we need to re-screen! It's black, plastic, about 1/4 to 1/2 " wide and quite strong. do you have any idea where I can obtain more?? I have an aluminum sliding patio screen door. The old T splining seems to be 11/64 (0.172) inch. Do you sell any such thing, or something else that would suffice? Right now I only need 2 inches of the stuff, but it would be nice to have enough to re-do the entire screen. I can buy 25 feet of 5/32 (0.156) t splining. Would that do? The only place selling 11/64 t spline sells only 500 feet of the stuff. For the 2 inch gap I want to fill, can I use round rubber splining? With T splining you have to use the size the frame was designed for. If you use .156 in a frame designed for .171 the spline may push out too easily. I have .175 T splining and I can sell you 25 feet. $3.50 plus shipping. Let me know if you want me to send you some. My dogs went through the last door with their claws. When I bought a replacement, i bought screening that is pet resistant. I could put it into the door groove, but when i went to reuse the spline, it won't fit. It's an odd shape anyway, it's built like a "T" on the cross angle, not round like a straw or rope. So I'm wondering if I am best suited replacing the screening again with something that matched old, or trying other splines out till I find one that may fit. We had a custom sized set of French doors replaced at our house, and since the contractor did not get a screen door from the supplier, he had another one made by a different contractor. The door works fine, but I noticed that the splining is on the outside of the door. Is this common? I have always seen them on the inside, as we are more concerned with it looking nice from the exterior of the house. Usually the splining is one the outside, but there are a few models as you have noticed, which have it on the inside. It makes no difference in the operation and use of the door. Just which side you install the screen on when it is required. I Have a sliding screen door, trying to replace spline, the opening is quarter of an inch. where could I find the splining to fit the opening ? Strong winds off Lake Huron occasionally tear large fibreglass screens out of their wooden frames on the screened porch at my summer home. The screens are stapled to the frames and have a wooden moulding nailed on top. The problem recurs despite large numbers of closely spaced staples and nails. For future repairs I plan to rout a channel into the wooden frames and secure the screens with splining before replacing the mouldings. This strikes me as probably much stronger and less likely to tear. My concern is to properly match the the size and material of the splining with the width and depth of the routed mortise in the wood. Should the splining be the same size as the slot, a bit smaller for snugness or larger to allow for the screen thickness? Router bits usually come in sixteenth inch gradations - 1/8", 3/16" or 1/4". What do you recommend for both slot size and splining size and material? Can't find correct flat spline!! The roller's groove is always much too small for any spline, why don't they make a fat groove roller.